What does your dream home look like? Well, if it happens to feature a big open-plan living space with an attached terrace, 4-5 bedrooms, 3 bathrooms, 2 dressing rooms and a garage big enough for two vehicles, then what luck: for that is exactly the sort of structure we are viewing today! 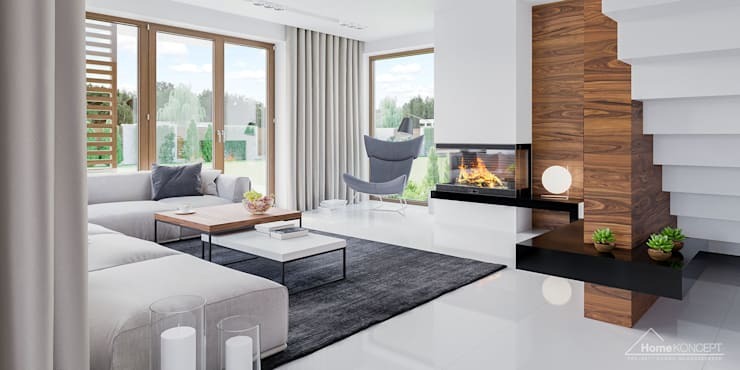 Courtesy of Polish architectural firm Homekoncept, this modern house clocks in at approximately R1.5 million – not bad at all considering all the space (183m², excluding the 42m² garage) and amenities that come with it! 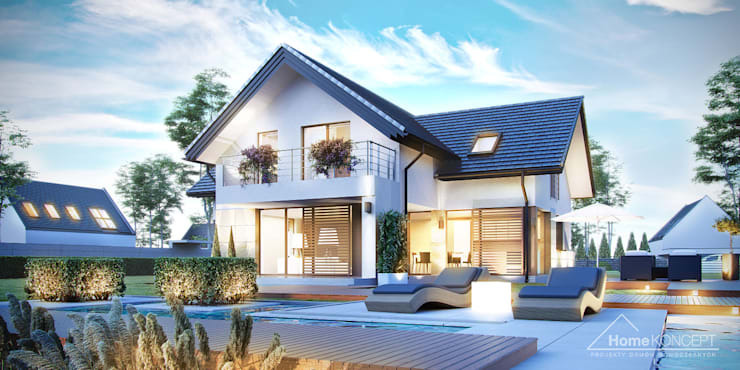 And to cater to your exact personal style, the creators behind this structure are also able to offer this home with a variety of different options and customisations. Even from the front exterior side, we can already see that the house provides all the comfort and ease of a modern-day design. But to give it that practical, family-style feel, it also features a classic form complete with a pitched roof. Double-layer ceramic blocks are responsible for the house’s sturdy walls, which are both insulated and sound proof. Our favourite piece here? It has to be the garage’s golden-clad façade, which also forms the structure for the top-floor balcony (which leads out from one of the bedrooms, by the way). Relaxation and family time were definitely the key terms behind the back yard’s design. 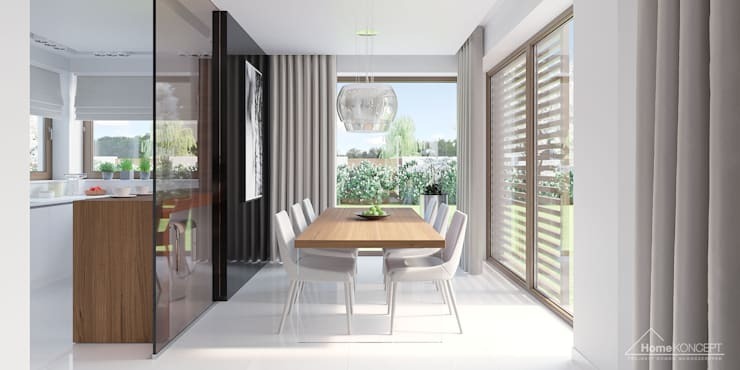 Here we are treated to large glass doors that really help encourage a sense of flow towards the outdoor entertaining areas, which includes a swimming pool and spacious deck. And even though these exact garden designs aren’t part and parcel of the architectural plans of this modern creation, we are definitely sold on them! Even though the house is quite spacious, it has been carefully laid out to include various rooms and spaces. The use of a variety of materials (like wood and glass) also helps to flaunt a very modern look that is visually pleasing. Of course elements like these are quite budget-efficient and easily customisable. Notice the chic furniture and décor pieces. If this was your home, would you decorate it exactly like this? What would you change? Should you require some assistance, have a look at our collection of interior designers and decorators here on homify. The kitchen is connected to the living room via the open-plan layout, but set slightly to the side to create privacy. 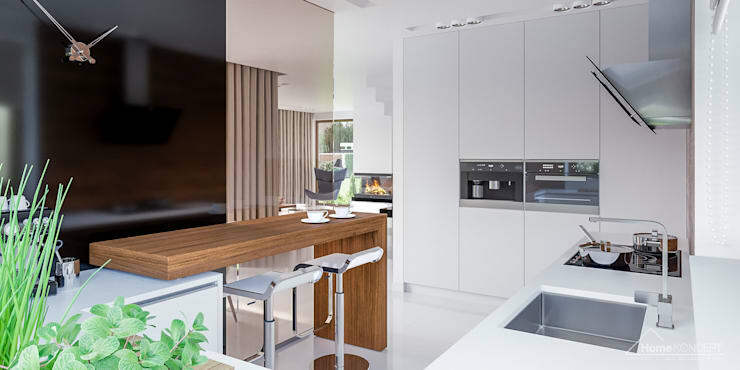 This contemporary style benefits from all the latest touches regarding kitchen designs, including modern appliances, ample storage spaces, and even a peninsula which doubles up as a working top and a dining area. Even though the dining area is a bit small, it has one of the best spots in the entire house, as it enjoys a prime view of the surrounding gardens. Situated next to a corner window, it is also lit up fantastically via sunlight throughout the day. Notice the glossy black feature wall on the left that adds a hint of formality and helps to keep the colour palette interesting. Don’t be misled by this bathroom’s tiny appearance – it flaunts all the necessary elements and does so in an incredibly sleek style. Bet you didn’t notice at first that the back wall is, in fact, a floor-to-ceiling mirror which visually doubles up the entire room. And seeing as it presents such a sophisticated colour palette, a contemporary sink, a walk-in shower and a wall shelf for a range of bathroom goodies, we can’t see how anybody would have a problem using this bathroom on a day-to-day basis. For another structure with a fantastic look, check out A beautiful villa with a deceptive facade. So, how about it? 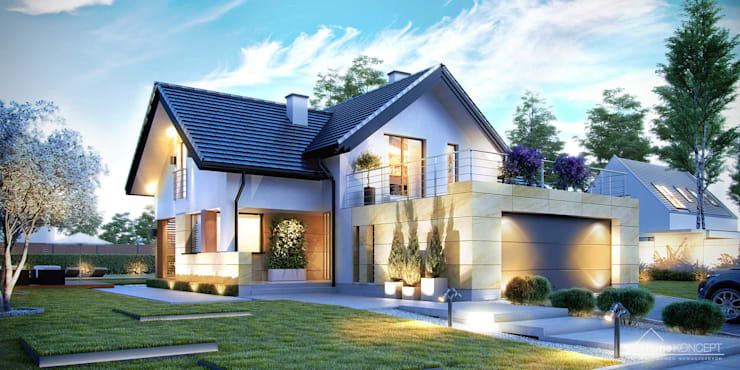 Does this house look like the perfect dream home?